The design of a metal parts, cherry blossoms, and a leaf changes respectively with a time and mounting companies. It passes over a printing photograph only to an example. 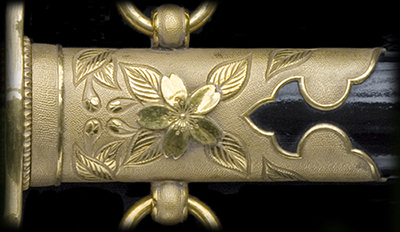 The hilt and hilt metal parts of the Meiji term. A metal parts is quality and an engraving pattern is minute. The hilt and hilt metal parts of the Showa term. Compared with the Meiji term, if a time falls, the pattern of a metal parts, cherry blossoms, and a leaf will become simple. 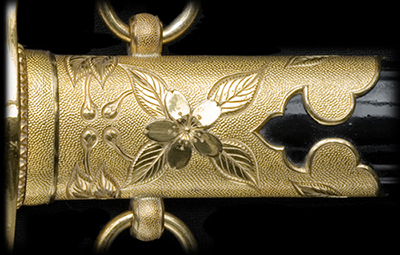 The hilt of the Taisho and Showa term, a peg , the cherry pattern of the pommel crown. Therefore, a shape differs from a pattern considerably in a mounting-company. Metal parts of the Meiji term, Gilding. Metal parts of the Showa term, Seto plating. The difference in the design which depends not only on the difference in an era but on a mounting-company. The coarseness of a Nanakoji is also different. Various cherry-blossoms and leaf patterns. The pattern of the Meiji term. Cherry blossoms are convex engravings. A bud and a leaf are line engravings. The pattern of the Meiji term. Cherry blossoms, a bud and a leaf are all line engravings. The pattern of the Showa term. Cherry blossoms, a bud and a leaf are all convex engravings. Showa term dirk top bird's-eye view.